It is an age-old cliche. Except, in this case, business wasn’t just part of it. Dollars and cents were at the centre of it all. The Ottawa Senators traded alternate captain Dion Phaneuf and forward Nate Thompson to the Los Angeles Kings on Tuesday night in exchange for oft-injured winger Marian Gaborik and depth centre Nick Shore. The Senators retained 25 per cent of Phaneuf’s salary for the three-plus seasons remaining on his deal – the same term to go for Gaborik. On the surface, the swap might seem like a head-scratcher, especially since Gaborik has missed more than one-third of his games over the past five seasons. Phaneuf is three years younger and has two more points than Gaborik this year. 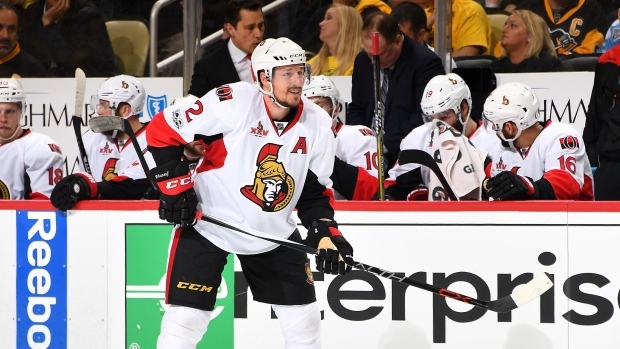 But a deeper dive into the numbers reveals that the Senators will save approximately $5.5 million (US) in real cash between now and 2021 as a result of the transaction – even factoring in the money retained on Phaneuf. That had to be the key to the deal, after Ottawa owner Eugene Melnyk hinted during his December rant that the Senators needed to shave salary. He said a $68 million payroll was “way too much over a revenue base that we have” and he was tired of bankrolling team operations. After some called Phaneuf’s seven-year, $49 million contract signed with the Maple Leafs as unmovable, he is on the move, this time to Los Angeles, for the second time in nearly exactly two calendar years. Phaneuf was pulled early from Tuesday night’s Senators loss in Pittsburgh as a precaution to ensure completion of the NHL’s most significant trade since Nov. 30. He won’t have to go far. The Kings will arrive in Pittsburgh on Wednesday ahead of his debut against the same Penguins. The Kings were one of the 12 teams on Phaneuf’s accepted trade list. Ottawa was equally as accommodating for Phaneuf as it was in moving Mike Fisher to be near his country star wife Carrie Underwood’s homebase. Phaneuf’s wife, Elisha Cuthbert, is a Hollywood actress. It’s with a tear in my eye I say goodbye for now, to 2 good friends and true pros. I wish you nothing but the best @NateThompson44 and my dearest friend Dion. Senators coach Guy Boucher called it a “sad day,” but it was hardly a surprise. Ottawa has been in sell-off mode for weeks, with GM Pierre Dorion working the phones to reshape a team in the Eastern Conference basement just a few months after a Game 7 loss in the Conference final. That playoff run was by far the closest Phaneuf has gotten to Lord Stanley’s holy grail. He may get another crack now. Gaborik, who turns 36 on Wednesday, helped the Kings to the 2014 Stanley Cup as a rental acquisition. His reward was a seven-year, $34.13 million deal from then-GM Dean Lombardi, a contract that has been a near-constant nightmare for the Kings. That contract’s inclusion made it easier for the Kings to absorb Phaneuf’s new, lower cap hit – even with Drew Doughty set to soon become a free agent on the blueline. Gonna be hard to say goodbye to 2 awesome teammates. Dion took me under his wing from the moment he came to Ottawa and always looked out for me. Something I’ll always remember and appreciate. Good luck boys, you’ll be missed! Phaneuf’s departure will likely mean more opportunity and ice time for highly touted rookie Thomas Chabot, among others. The rest of the Senators will hold their breath, though, over the next 12 days until the NHL’s Feb. 26 trade deadline. There is more money to move out. Mike Hoffman, Jean-Gabriel Pageau and Zack Smith have all been prominently featured on TSN’s Trade Bait board. Centre Derick Brassard will soon join the mix. Phaneuf’s trade will likely have little impact on the overall trade market. Defencemen and centres are at a premium, but Phaneuf was ranked 39th on the board because of his contract. The $5.5 million saved over the next three seasons may not seem like much, but for the cash-strapped Sens, every dollar squirreled away is one more Dorion can use to take a run at captain Erik Karlsson this summer. That is as big a win as any on the trade front.